SilverRain, I don't disagree with you- I think it is clear that we each are responsible for our own thoughts, desires, and actions. 1. What part do stewardships play in the equation? Although we can't be responsible for others, I think we have a responsibility to influence others for good. Not at the midnight hour, but beforehand I think we can help others add oil to their lamps. 2. To what extent do we consciously add oil to our own lamps versus finding our lamps being filled as we focus our efforts on others? 3. We are often taught to be self sufficient or self reliant. In most cases this is probably good advice, but I sometimes wonder if this way of thinking "spills over" into our spiritual lives. We may think that we have to "earn" our way to heaven by sheer grit, or that we can make it on our own without needing a Savior. I think the scripture that we are saved by grace after all we can do applies here, but I think it is very easy to misunderstand the nature of grace. I don't think any of this contradicts what you were saying, but I am interested to get your thoughts on these topics. Indeed, at the end of the day, each of us has to choose whether to accept what Christ offers us. Much as I might want my people to choose Him, I can't make them. I can encourage and support, but that is really the limit. I had never thought of seeing all ten virgins as righteous before. I like it, though. All believed, all came, but only half of them prepared themselves to meet God. Interesting reflections on this parable. I like the application of not trying so hard to 'save' others that you neglect yourself. as Jim said, there is a balance, but I think the point you make is important. There's a difference between earnestly doing our best and taking on others' salvation, which in a sense can end up more like codependency, if not violating their agency in significant ways by trying to force them to follow/choose. Jim—You have some interesting questions which I will have to address in another post, once I've thought it over somewhat. The short answer would be to develop a relationship with the Holy Spirit to help discern the difference between spiritual selfishness, self-reliance, charity and moderation. I think Michelle has some good insights to this, too. 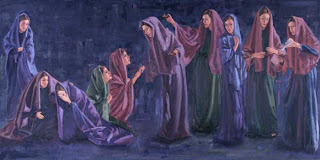 I've recently had some very similar insights into this parable, SR. One of the things that strikes me is that to all appearances, the foolish and the wise virgins seem to be the same. They have all taken on the outward appearance of ones waiting for the Bridegroom, they are all carrying their lamps. The problem for the five is that they have no oil in their lamps, and so are unable to illuminate ... whatever it is that they will need to illuminate. They have the form but not the substance, and what they are missing is the ability to generate light. It took me a long long time to learn that I can't save other people, too. I tried to save people into the church, and to some degree tried to save them out of it. And, now, finally, I know that my _first_ objective is to keep my own self in oil (no mean feat). Everything else is inviting and encouraging other people to do the same. Great post! I just "discovered" your blog after reading your comments on other blogs. This is near and dear to my heart. I've been a "fixer" all my life, and only in the last few years have I come to realize that sometimes I'm trying to fix what isn't mine to do. I think you've captured the parable quite well: in some ways it is not possible for us to share our spiritual light to save another. Each must find his own. That is not to say we should not testify, encourage, invite and teach. But in the end, there are certain things I cannot do, and I must allow the Savior to do. If I don't, I then demonstrate either my lack of faith or my sense of pride. Does this release us from shepherding stewardships? Of course not. But it might inform how we fulfill those stewardships. One other thought I had with some parallels to the Adam and Eve story: the foolish virgins went to buy oil, and were caught unawares as they were trying to cover up their mistakes. Is it possible that had they simply waited without oil that they would have still been able to go into the feast? Great question. Maybe it wasn't the lack of oil as much as the lack of being there when the Bridegroom arrived.